Food allergies are an increasing health issue in Western societies, presenting a major challenge for the food industry. As a result there has been a wealth of research into developing effective methods for detecting allergenic residues in food. Detecting allergens in food reviews the range of detection techniques and their application to all the main allergens in food. The first part of the book introduces the nature of food allergy and the range of plant and animal-derived food allergens. Part two reviews the range of detection methods from the use of antibodies in immunoblotting and enzyme-linked immunosorbent assays (ELISAs) to polymerase chain reaction (PCR) methods and the use of lateral flow devices. Building on this foundation, Part three looks at detection methods for particular allergenic foods, from peanuts, tree nuts and seeds to dairy and egg residues, wheat gluten, soy, fish and crustaceans. The final part of the book looks at key issues in using detection methods effectively and the regulatory context in the USA and EU. 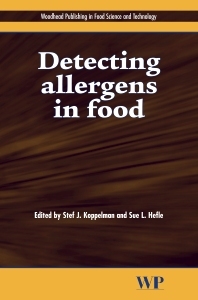 With its distinguished editors and international team of contributors, Detecting allergens in food is a standard reference work for the food industry. Dr Susan L. Hefle is Associate Professor and Co-Director of the Food Allergy Research and Resource Program (FARRP) at the University of Nebraska, USA. Formerly with TNO Nutrition and Food Reseach, Dr Stef Koppelman works in the Department of Dermatology and Allergology at University Medical Centre Utrecht, The Netherlands.